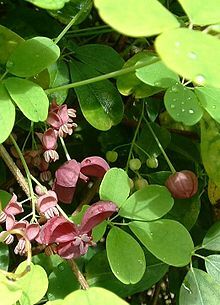 Akebia is a genus of five species of flowering plant, within the family Lardizabalaceae. The scientific name, akebia, is a Latinization of the Japanese name for species Akebia quinata: akebi (通草). Akebia quinata and Akebia trifoliata both bear edible fruit, containing a sweet white flesh. Flavor varies greatly in akebias, even within the same species, with some individuals displaying a complex flavor profile resembling a mixture of banana, passionfruit and litchi, with others being mild, or even insipid. Akebia is often mentioned in Japanese literature, where it is evocative of pastoral settings. Although the akebi commonly refers to the five-leafed species, the three-leafed species is used in much the same way for novelty food, medicine, and for vine material. It is something of minor food source that was foraged in the past, now it is considered a specialty crop, only available when in season. The pods contain a white, semi-translucent gelatinous pulp that is mildly sweet and full of seeds. The taste is described as sweet but rather "insipid". Some people recollect in idyllic terms how they foraged for it in the hills as children. The purple-colored, slightly bitter rind has been used as vegetable in Yamagata Prefecture or in those northern areas, where the typical recipe calls for stuffing the rind with minced chicken (or pork) flavored with miso. Minor quantities of akebia are shipped to the urban market as novelty vegetable. In Japan, the leaves are made into a tea infusion. Also, Akebia vines are used for basket-weaving crafts. An old source lists Minakuchi, Shiga and Tsugaru (now Aomori Prefecture) as localities that produced baskets from the vines of trifoliate variety. ^ "Akebia". Flora of China. Retrieved 2009-04-05. ^ "Akebia: A Potential New Fruit Crop in China". HortScience. ^ a b Nimura, Kazuo(二村一夫)r (2006-07-22). "食の自分史" [Self-history on food]. 『食の自分史』. Retrieved 31 January 2017. ^ Agricultural Society of Japan; Dai Nihon Nōkai(author alia) (1895). Useful plants of Japan: described and illustrated (google). 1. Agricultural Society of Japan. p. 92. Bailey, L. H. (2005). Manual of Gardening (Second Edition). Project Gutenberg Literary Archive Foundation. This page was last edited on 26 January 2019, at 13:53 (UTC).